You are currently browsing the category archive for the ‘Homemaking’ category. Yesterday I checked my email and RSS feeds while letting lime-remover soak on the 70-year-old hexagonal tile shower floor. The shower, which had not drained while we had company last August, and then, without intervention, behaved itself quite nicely, started draining very slowly last week. Robert had spent some time trying to remove the cleanout, accessible in the basement ceiling, to no avail. This morning, after trying baking soda and vinegar, which made satisfactory bubbling and gurgling noises, but failed to improve matters much, I managed to remove the drain cover, once I figured out the screws were missing and the holes filled with grout, and Robert snaked it out. We went off to our ACE hardware to look for a new cover, since the old brass one had large holes and the chrome was wearing off. They didn’t have one, somewhat surprisingly, since they are an old-fashioned hardware store with many fascinating things that the big box stores don’t carry, and lots of clerks who come up and ask you how they can help. “It’s a very old shower,” I said, and the hardware guy said, hefting the cover, “They don’t make ’em like that anymore. They’re all flimsy now.” We got an aluminum cover that clips over the old one, hiding the flaking chrome, and, I hope, keeping hair from clogging the drain. Since I was, in fact, at that moment, enjoying cleaning house, and not exactly someone who has ever believed “a woman’s place is (just) in the home” or that my identity depended on my housekeeping abilities, I was a bit ticked. Cooking and cleaning are crafts, as well as being essential, and just as satisfying, in performance as in results, as any other craft. I replied with the Zen saying, “Before enlightenment, chop wood, carry water, after enlightenment, chop wood, carry water.” One young woman thanked me for the different perspective, but another asserted her right to hate housework. Well, yes, but hating anything is generally a waste of time and energy; better to focus on the experience and doing the job skillfully. Our local television station has declared this a “Summer of Sustainability.” They asked for contributions on what people do that is sustainable. I haven’t heard back from them, so here is what I sent. Our sustainable living is not especially creative, it is just old-fashioned simple common sense that anyone can do, not trendy or radical, and inexpensive. We have lived this way all our married life – 30 years and two children, and we both worked full-time all that time. I was pleased to see iron skillets and cast aluminum endorsed at the end of this article on silicon cookware. We cook almost entirely in our iron skillets – large, medium, and small, an iron griddle, and two old Revereware saucepans, large and small. We also have Robert’s mother’s cast aluminum set, which goes camping and is also used for poached eggs, and a couple of large stainless steel pots with a steamer for large quantities, rarely used. And pizza pans. Cornbread? Chicken pot pie? Pfannkuchen? Baked in an iron skillet. Pasta sauce, stir-fried vegetables, scrambled eggs, omelets – iron skillet. A variety of pancakes, of course, on the iron griddle, but also biscuits, Navajo fry bread – and grilled cheese sandwiches – topped by and iron skillet to squish them. When we were camping out in the house before we moved the furniture, we had just an iron skillet and a pizza pan. Pancakes did fine in the skillet, just a little harder to turn. My mother got a new-fangled Teflon skillet once. It was awfully fussy, soon scratched, and then difficult to clean. I never had the desire. Ours are just plain, old-fashioned iron skillets, a design unchanged for centuries, no fancy colored ceramic outside. Robert arrived in my life with one, I had one. We’ve picked up more along the way. We provided our daughter with one, which she claims is just not as good as ours for pfannkuchen, one of her favorite foods. She and her brother will inherit ours, eventually. I had my grandmother’s iron griddle, until it broke, after what must have been more than half a century. I still have her iron corn stick pan, which doesn’t get as hard use. It is raining and looks to do it all day. This means no temptation to go pull dandelions, move perennials, gather more brush, or any of the other outdoor chores. Looking at things as they are, and seeing all that needs to be done, it is hard to remember how much we have already done. 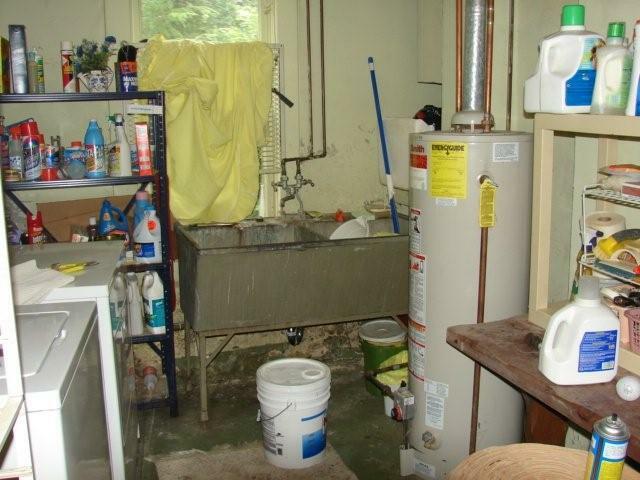 So I pulled up the pictures the inspector took when we were negotiating for the house two summers ago. Many of our new neighbors saw the house when it was on the market, and wonder what we saw in it. I look at the pictures and think we must have been crazy, but I thought there were good bones underneath, and the inspector said it was “overbuilt”, and basically sound. Robert cleared out the clutter, and I added a sink skirt from a three-dollar plastic tablecloth, covering the step stool (an inheritance from the previous owner) with the same, and a three-dollar cotton rug from Ikea. It won’t be appearing in House Beautiful, but it is now pleasant and usable. The Pew Foundation does fascinating (to me at least) public opinion surveys. I ran across the results from a survey on necessities versus luxuries – which only includes, unfortunately, a few household appliances and electronics. Oddly to me, the percentage of people who view a car as a necessity dropped from 93% to 91% from 1996 to 2006. We don’t have cable or satellite, a flat screen TV, or an iPod. 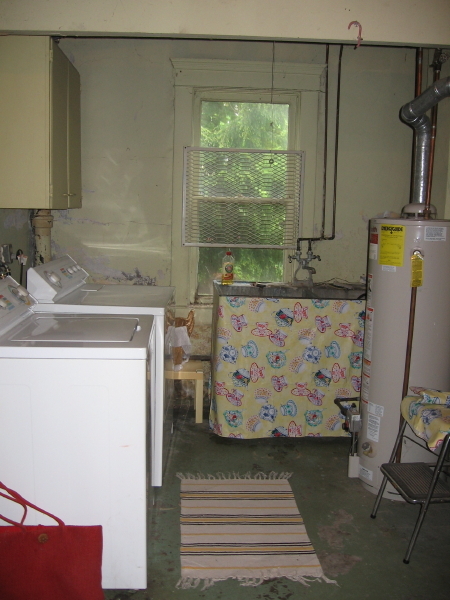 We rarely use our clothes dryer, air conditioning, microwave, dishwasher, and cell phones. I could live without everything else except the car, computer, and high-speed internet, although a washer comes close to essential. We went to Huntington for a family funeral last week, and stayed at my cousin Fred’s on the Coal River in St. Albans. Fred is an enthusiastic cook, and he devotes a lot of time to it, since he has retired and his wife Anne hasn’t. Among other things, he had homemade pimento cheese spread. I can go years without thinking of pimento cheese, but recently we have been having pimento cheese sandwiches for lunch. I didn’t try Fred’s because it has pickle in it. Pickles are one of the many things I didn’t eat when young that I still don’t, although I’ve learned the joys of a few things. Two of my aunts went to the “big city” when young and raised their families there. Two of their children, Fred and our cousin Mike, are still there, and another is not far away. They are like me in holding onto our history, including things, all kinds of things from the past. We’re all interested in the family genealogy and history, and we all have furniture, books, magazines, pictures, papers, stuff, from the family. Fred has my grandfather’s ’56 Chevy. I sleep in my great-grandmother’s bed, but worse, I had my mother’s curling iron from the ’70s in my luggage. So the pimento cheese came with a story, about Aunt Roberta, Mike’s mother, getting an electric grinder for Christmas, and Aunt Doris, Fred’s mother, thinking it was wonderful and getting one, too. They still have them, of course. My mother had an old cast aluminum hand grinder. I can see it clamped to the kitchen counter, but I can’t quite see what is being ground. I can’t think of what it could have been except pimento cheese. Mincemeat? Did she really make her own mincemeat? She made chocolate-covered cherries, so anything is possible. There was a tube to attach to fill sausage casings, but we never made sausage, although I always wanted to. Coming home, we stopped at Sisters Antiques in Flatwoods. There was not one, but several, old cast aluminum grinders. When I was making the pimento cheese today and pushing it through with a wooden spoon, I remembered the other accessory – a sturdy wooden pestle. It is spring. Never mind the solstices; Robert and I agree that March, April, and May are the spring months; summer starts on Memorial Day weekend and ends on Labor Day. There are some small patches of snow left in the dark corners of the yard, but it is 72° and sunny, and there are robins. Other people’s crocuses are blooming; ours again this year are just leaves. Yesterday Robert cleaned up the broken bits of fence from the car-in-the-yard incident New Year’s weekend. There had been snow cover ever since then, too much to clean up the pickets which were scattered everywhere. We had lunch on the patio, which has a view of the largest patch of English ivy that I didn’t get to last spring. It was irresistible, and I managed to remember to keep my wrists straight most of the time. I was hoping it was weakened by three months of cold and snow, and would give up easily. I did manage to pull out almost half of it, while Robert picked up sticks and raked leaves that had appeared from who knows where over the winter, since the lawn was clear before the snow. While ripping it up, I realized that it is probably the only level area on the property that gets 6 hours of sun, other than the strip along the front fence. So we will try our vegetable garden there this year. Perhaps something very French with boxwood borders. Today’s Washington Post details the current recall of processed foods made with hydrolyzed vegetable protein from Basic Food Flavors, a list that is now over 100 products. Basic Food Flavors tested surfaces near food-processing equipment throughout its plant twice in January and once in February, and each time the samples showed salmonella contamination, according to FDA records. The company continued to ship products and to make more HVP without cleaning the plant or the equipment in a way that would have minimized contamination, the records said. Foods that used the contaminated HVP include some sold by national chains and manufacturers such as Trader Joe’s, CVS, and McCormick. The description of the Basic factory conditions is truly disgusting. It should, in the best of all possible worlds, have the effect that Upton Sinclair’s The Jungle had on the meat-packing industry, including inspiring the creation of the Food and Drug Administration – only, now we already have the FDA. Unfortunately, the FDA does not have enough inspectors to police food manufacturing; it generally only checks when there is an epidemic or a complaint. Maybe this will at least persuade people not to use gravy, stuffing, and salad dressing mixes and buy so many other snack and prepared foods. Is it harder to mix vinegar, oil, and dried seasonings yourself than to dump in a packet of who knows what? Is gravy really too hard to make without a packet of gravy mix? Really? My several years of reading mysteries seemed to have dulled my enthusiasm, and Monday I found myself wandering rather aimlessly through the public library for alternative reading. I eventually ran across Sixpence in Her Shoe, by Phyllis McGinley, and rediscovered what was undoubtedly a large influence in my attitude to homemaking and housekeeping. This is a book by, for, and about the American housewife….And it is the rewards as well as the challenges and difficulties of creating a home that I discuss here….When I speak of housekeeping I do not, of necessity, refer to housework. This is no manual on how to polish brass or clean ovens or have the whitest wash on the block. Being a housewife may or may not entail all these tasks; it has, at times, for me. But tasks is what they are, nothing more. They do not touch the heart of the matter. For McGinley, the heart of the matter was the home as the core of society. She was writing in 1960, before Betty Friedan’s The Feminine Mystique kicked off the second wave of the feminist movement, but at a time when American women were criticized for being in the workforce, for being educated and staying out of the workforce, for not adequately supporting or even emasculating their husbands, for smothering their children, and a variety of other, often conflicting, faults. I was nine. My mother, and almost every other woman I knew, was a mother and a homemaker, and had a job. My mother was a teacher. Johnnie Keith next door had two boys, a husband who was a manager at the Farm Bureau and ran cattle on a farm out in the county, and she kept the books for the monthly cattle auction, which kept her at work after midnight on that Saturday night. Fannie Reed across the street was the buyer for the department store her husband managed, and glamorously went to New York City on buying trips twice a year. Never mind that the top end blouses at Morrison’s were Bobbie Brooks, a brand now sold mostly at Wal-Mart. Other mothers ran or worked in local stores, as well as teaching school or nursing, and many worked at the state mental hospital or the sweater factory. My great-aunt Iona worked in the family jewelry store, and her sister Eunice was a dressmaker. So I didn’t have much experience with McGinley’s world, which was homemakers in the suburbs and small towns of New York and Connecticut, graduates of the Seven Sisters or other liberal arts colleges, married to husbands who commuted into the city by train, to jobs in finance, advertising, or law. But I did see the point of the importance of the home as well as the office – and like most of my generations, wanted to “have it all.” Unlike the girls who grew up in those commuter towns and subdivisions, I had the example of women who were doing it all. And I found a husband who had had the same; not only a mother who worked, but a father who worked in town, and was as involved at home (as mine was) as our mothers were in the world outside the home. I have been doing insight meditation as part of the Winter Feast for the Soul, and in the talks at the beginning, “practice” comes up often. Meditation is an important practice in many types of Buddhism, as it is in some parts of Christianity and other religions. Mindfulness, paying attention to what is happening each moment, is another practice especially associated with Buddhism, but which can be found in Christianity, also. Prayer is, of course, a practice, as is worship. I grew up in a part of Christianity, the American Baptist church, which had very few practices. Study of religion in Sunday School was one, Sunday morning worship, daily individual prayers, and in our family, a daily brief reading and prayer as a family, and grace before meals. Beyond this, there was not particular guidance on how to live daily life, beyond the Ten Commandments, which tell you what not to do, and Jesus’s overriding command to love, which is not specific. Like many others in the 60s, I discovered Buddhism in college, and thought about meditation and mindfulness, but didn’t really practice. Starting my own household, there were a few things I started doing that I meant to put my beliefs into practice: being vegetarian for a while, and then eating little meat; using cloth napkins and sponges instead of paper napkins and towels; composting and recycling; trying to eat “real”, natural and whole foods; living simply. When I was a new mother and a branch librarian in a Jewish neighborhood, I became fascinated with Jewish household books, which give detailed instructions on not just keeping kosher, which most non-Jews have heard of, but the many other lesser-known aspects of traditional and Orthodox Jewish life I didn’t know about. I was envious of Jews, who have developed rituals and prayers for everyday acts, to continually remind of the sacred. We added a few family rituals, lighting candles for family dinners and saying grace. We tried to add nothing to our lives that was not useful or beautiful, preferably both. We tried to be outdoors and really see nature often. But I think now there was not as much real practice as there might have been. Now that I have more time to explore and to practice, I am trying several different practices, which I will be sharing a bit about here.